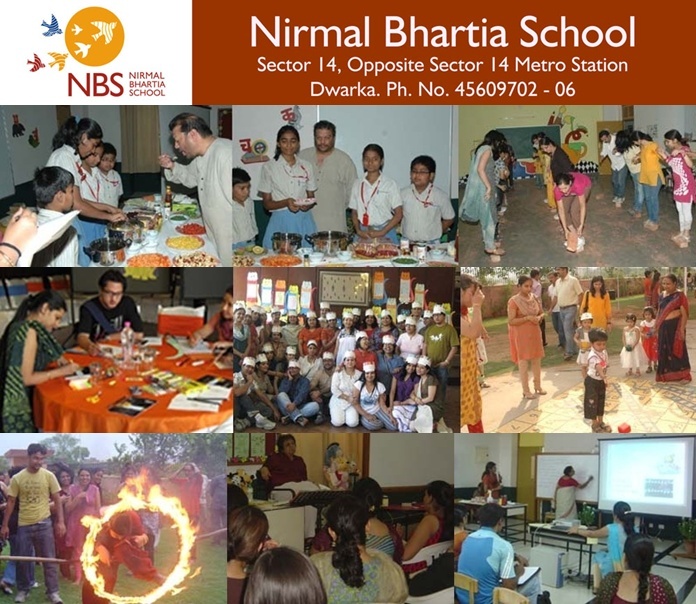 At Nirmal Bhartia School, we believe that education must go beyong equipping a child with the knowledge and skills required to ‘prepare’ him or her for life;rather,it must integrate the child’s growth and evolution into everyday life, so that learning is authentic, meaningful and rooted in the ‘real-world’ from the very first day of school, and the transition into each life-stage is natural and dynamic. Thus, as educators we dedicate ourselves to providing a gentle, holistic system that teaches children to work together,to recognise and respect each other’s strengths and leverage them to mutual advantage, all with the complete and total support of family, school and the community, as they each mesh into one large and beautiful fabric of living and learning. with a positive outlook to life and change. The Power of Community – Our Approach The entire blueprint for life at NBS is one of nurturing our students to learn, not in isolation, but as part of a loving and dynamic community, and thereby nurturing the community itself – parents and grandparents, educators, visitors, health advisors, environmentalists, artists, nutritionists… all those who come together to facilitate learning at entry level. Here, at NBS, our children depart from traditional, defined study methods and enter into an expanded and pioneering space for learning… a space where they experience the immense power of community. In order to give our children the absolute advantage of community, it is imperative that we first meet their individual mental, physical, emotional and development needs in the best possible way. This cannot happen without giving them sufficient personal attention. Thus at NBS, we are careful not to lose the advantage of staying small and focused. We maintain an optimal staff-student ratio of 1:10. The overall school size is deliberately limited, with two sections per class of no more than 25 students per section. At NBS, we encourage our children to learn in coopeartive and collaborative ways with and from each other. Thus, rather than being passive receivers, they debate and discuss, review each other’s work and learn through presentations and projects in the true spirit of the community. Since most of life’s really important tasks involve working with others, our students are uniquely equipped to achieve what they set out to do in the real world. Educators at NBS do not work alone; they reach out and partner with parents and the extended family. Parental participation is recognised as a vital component in a child’s education, and when parents and educators work together, they create a learning environment without conflict – one that is secure, creative, healthy and happy and that extends seamlessly from home to school and into the world beyond. Our educators continually update our curriculum to ensure that it remains intimately connected to the life experiences of our children and responsive to the needs of the community. Thus field trips, interdisciplinary projects, interactions with guest experts and community service are all an integral part of our programme. At no point in time do we wish our children to ‘shut down’ on the ringing of a bell. Thus, learning never comes to an end at NBS. Innovative after-school programmes and weekend family events ensure that it continues even beyond school hours. In keeping with our spirit of lifelong learning, we share our facilities and invite members of the community to use the sports fields, computer rooms and library at their convenience and to look upon the school as an extension of home. She completed her schooling from Carmel Covent, New Delhi and graduated from St. Stephens College, Delhi University with an Honours Degree in Economics. She then went on for further studies to the University of Oxford and specialised in Politics, Philosophy and Economics. With a keen interest in curriculum development and school reform, she pursued a Masters’ in International and Comparative Education from Columbia University and conducted research for The School, Krishnamurti Foundation India, Chennai. A progressive thinker and a visionary committed to the cause of education, she has been instrumental in founding the Nirmal Bhartia School.